I started brewing in the 1980’s, which was the modern equivalent of the wild west days of home brewing. We simply did not have either the technical knowledge or access to the high quality ingredients that brewers have today. Yeast, in particular, was one ingredient that improved dramatically in the last 20 years. When I started, the only yeast available was dry packet “bread-style” yeast. It came in two flavors – ale and lager. The quality of these two yeast strains was questionable, resulting in significant variation in flavor and character. In the early 1990’s Wyeast and White Labs introduced high quality liquid yeasts to the US homebrewing market. Companies like SafeAle also brought high quality dry yeasts into the picture. This revolutionized homebrewing in a way that is difficult to explain today. 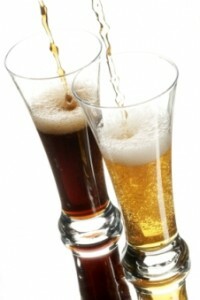 Ale yeasts ferment in the range 10-25C and produce beers high in esters and often lower in attenuation, both distinctive characteristic of ales. Ale yeast strains are often mixed together to aid in attenuation and flocculation. Lagers ferment in the range from 7-15C and produce a cleaner beer with lower esters. Yeast goes through four overlapping phases when fermenting beer into wort. After pitching, yeast starts in the “Lag Phase”. During the lag phase, the yeast strives to reproduce as fast as possible. The key ingredient during this phase is Glycogen, an sugar stored internally in the yeast, which is broken into glucose to fuel yeast reproduction. If an insufficient amount of yeast is pitched (or the yeast itself is low in glycogen), you will get an excess of dicytl (buttery or butterscotch flavor) in your finished beer. A properly sized Yeast Starter is critical. The lag phase is followed quickly by the respiration (also called the growth) phase. In this phase the cells grow logarithmically (usually one to three doublings) by cellular division. In this phase the critical ingredients are oxygen and a variety of yeast nutrients. The cells will continue to grow until the oxygen or nutrients have been depleted. Once all of the oxygen has been scrubbed from the wort, the fermentation phase begins. Yeast cells convert simple sugars into carbon dioxide, alcohol and beer flavors. As the sugars are consumed, the gravity of the beer will rapidly drop. Fermentation normally takes 3-7 days. Sedimentation is the final phase of fermentation. Yeast will begin to form into clumps and settle to the bottom of the fermenter in a process called flocculation. In this phase, yeast will also store the glycogen needed for future reproduction as it prepares to enter a dormant state. Some yeasts will settle (flocculate) much more rapidly than others, so settling can take from days to weeks depending on the yeast variety. Attenuation: Refers to the percentage of sugars converted to alcohol and CO2. A high attenuation yeast will result in a clean, dry finish. Low attenuation yeasts typically leave ester, malt and other flavors behind leaving a more full bodied complex beer flavor. Flocculation: Flocculation refers to the ability of yeast to form clumps (flocs) at the end of fermentation and rapidly sediment (or be skimmed) from the finished beer. Low flocculation yeast is often called “powdery” yeast. High flocculation yeasts tend to fall out of the beer before completing fermentation, leaving a more complex, higher gravity beer. Low flocculation yeasts such as lagers will completely ferment, leaving a cleaner finish but it can then be difficult to separate the yeast from the beer. Temperature Range: Different yeast strains have differing temperature tolerances. Ales ferment at a higher temperature. Higher temperature fermentation is associated with higher ester production, and lower temperature with clean dry flavors. Alcohol Tolerance : Many yeasts are sensitive to alcohol content, and will have trouble fermenting very high original gravity wort. Champagne, Wine, or other alcohol tolerant yeasts are frequently used either for primary fermentation or as a second yeast addition to assure full fermentation of very high gravity beers such as barley wine. Beer Flavor: Individual yeast strains can add widely varying flavor profiles to your beer. A good example is Hefe-Weizen, where a significant majority of the clove and banana beer flavor comes directly from the yeast. Matching the yeast strain to the style of beer is a the best way to provide proper flavoring. In most cases, brewers tend to select the Wyeast or White Labs yeast that matches their beer style. Lets look at a few examples where varying from the script might pay off: One example is brewing an Irish Stout. Irish stout has a very dry roasted character derived from roasted barley. A traditional yeast choice might be an Irish Ale yeast such as White labs WLP004. However, looking at WLP004, it has a modest attenuation of 71.5%, which will produce a more fruity finish. One could experiment by picking WLP007, “Dry English Ale” yeast. This yeast has a much higher attenuation (75%) and will leave a drier finish on the beer, while still retaining some of the English esters needed for the stout. At the other extreme, I know several brewers that use a single strain, White Labs California Ale WLP001 for just about every beer they brew. Their justification is that this yeast is relatively flavor neutral for an ale yeast, has a very high attenuation and leaves a clean finish on any beer. It ferments rapidly and flocculates quickly from the beer minimizing storage time needed. Personally I don’t subscribe to this “one size fits all” approach, but a number of brewers have demonstrated great success with it. The above are just examples, but the key to great beer design is to understand the ingredients you are working with. Knowledge of the characteristics of yeast, and its significant effect on your beer will help you to become a better brewer. Thanks again for visiting the BeerSmith Home Brewing Blog. Click on the BrewPoll icon below if you enjoyed this article and subscribe for regular delivery. A thumbs up on Stumbleupon is also greatly appreciated. This is a great article but the author failed to mention growing a yeast starter, a technique that if done properly can greatly improve the quality of your beer. A yeast starter takes your dormant yeast through the initial stages then you pitch your actively growing yeast into your wort for an almost instant start. Great article. One minor typo – under ‘The fermentation life cycle’ change ‘beer into wort’ to be ‘wort into beer’. I just spilled possibly half my yeast pouring into car boy. 1.063 initial gravity/IPA. Should I buy more tomorrow or don’t worry about it? Right now I’m worried about it. Hard to tell – you can always pitch a bit more if it does not catch. Monitor your FG to see if you have completed fermentation. how much yeast is used in beer? It depends on the batch, but generally at least one vial or pack per 5 gallons is the min. A yeast starter is also recommended for most batches. Brad – you mentioned that the yeast cells grow logarithmically during the lag phase. That would be very slow indeed! I think you mean exponentially. my hubby makes beer and wonder how much of the yeast to use after he ferments it in the first stage( from the bottom of his carboy jug). I steel some before he racks it for the 2nd fermentation berfore he throws it out. I tried to make bread, or pizza dough. it came out ok but still dont know if i use to much or to little seams how its not dry yeast anymore and still active. can you tell me how much to use of the soupy yeast ? compared to the dry for making breads? Yes pH has a lot of impact on the final taste of beer especially during the mash but also in fermentation. Do a search here for my article on pH and water. Robin–treat the soupy mixture like a sourdough starter. Feed it roughly 2 cups flour (it should be about the consistency of oatmeal, if not adjust with more flour or water) and let it sit at room temperature in a bowl covered with a towel for 2-3 days until its puffy and slightly sour smelling. Then use a sourdough recipe to make bread (which also requires you to add some bread yeast). Why is it that dry yeast packs are not shown to be used with a starter? Dry yeast does not require a starter. You can merely hydrate it with warm water for 15-20 minutes before pitching. If you need more yeast cells, use a second pack. Your description of using the starter was understandable enough but how do I increase the starter for a 10 gallon or bigger batch. I want to get my costs down for larger batches. Hi.thanks a lot for the information .I brew for a long time.i live in iran so i didnt have good yeast.recently my cousin sent me safbrew s33 from canada(e491).finally i could make a good beer at home.i learned so much fromyou . Made a 6 gal 1.089 OG doppelbock on Sunday and did a 2 step starter… think I pitched about 950B cells of WLP838. Been fermenting at 50 deg but tonight (86hours after pitch) I wanted to take a sample to see if the specs lined to to 50% attenuation by this time. Racking arm accidentally pointed down and I wound up taking a bunch of really thick yeast – maybe a 5 oz. It’s still fermenting. Will the remaining yeast regrow to the right population to complete fermentation or should I consider pitching more.